My seven year old found my old school diaries. Not that they were hidden for no one to find, just that it was the first time that he took an interest in them. I have kept diaries, or journals, throughout my life – in fact, without them I don’t think I would ever have considered writing a novel at all. And so I have a big box of diaries that span my teen and young adulthood years (I journal less now that I write as an author). Only 2 actual diaries have sat on my writing desk for the last 4 years. 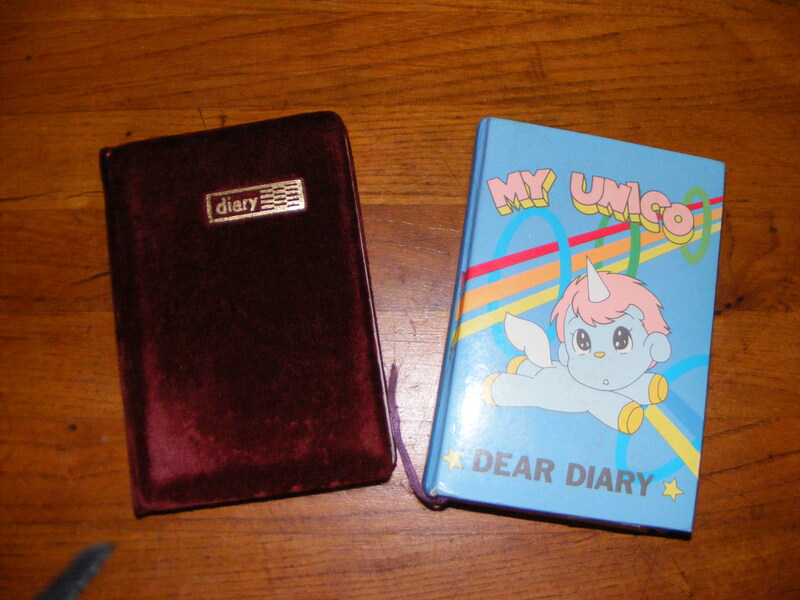 These two diaries were the background to the writing of ‘K-Girls’, and preparation for the sequel, ‘K-Girls Plus One’. I would have written them in 1984 and 1985, when I was 13/14. I have to confess, that most pages are typical of a teens worries, thoughts and moans, with the odd love lost or crush. All the same, for the most part, they are not suitable for a seven year old. What I find interesting is that neither of my teen daughters ever took much interest in them, and so it came as a surprise that my seven year old son was not only fascinated with them, but wanted me to read them to him, and went so far as trying to sneak them into his bedroom to try and decipher my scrawl on his own. As a parent third time round, I have learnt though, if you tell a child they can’t have something, they just want it all the more; and so in an effort to stem his new curiosity, I promised to read to him (that way I am in control) some of the pages within. And then I think, hang on a second, is this what blogging has replaced? And facebook? Only as we are sharing our thoughts with the world, do we hold back on our REAL opinion for fear of judgement, ridicule? With journals, the premise is that they are private and so we can CONFESS, without judgement. We can truly speak plainly and openly. OFF THE RECORD as such. I know certainly that I am trying to be more careful in my blogging, what to say, how to say it, who is possibly reading it, (if anyone). My journals, they have a different sense about them – raw, as-it-is. Warts and all. There is a lot to be said about that I think – I can see that within the diaries, is the forming of my true writing voice – capturing the real feelings of a young teen girl, even if in the 1980’s. Have teens changed a whole lot – you would think I would know having two of them but is the main difference being social media has perhaps indirectly created a censorship to a young person’s voice? In any case, I thought to share with you my first page in my diaries as a K-Girl – don’t get too excited now, I know my seven year old certainly didn’t. Since this is my first page I thought i might has well tell you that I most probably wont be able to write every night cause I’m not great at writing every night. I don’t know why I decided to write but I said to hell and took this out and here I am writing this. To-day is the 2nd day of lent and I’ve given up sweets and I have to try and keep it ’cause I usually break it. I’ve got to go to sleep now ’cause Miss Oakely is switching the light off now. lol – cringeworthy indeed – as long as we can keep laughing at ourselves eh! keep turning up for the page…. !